FK Lowry Piling have successfully completed their second Wind Turbine Project within a 2 month period. German Client, Enercon, sub-contracted the specialist piling works to FK Lowry Piling at Cheswold near Bishop Auckland in Co.Durham. FK Lowry Piling were sub-contracted to install 10 No. 880mm diameter Rotary Bored Piles to depths up to 22m below piling platform level. Each Pile was installed with a full length cage of 12B20’s and B10@250mm c/c. Typical ground conditions consisted of Made Ground/Fill overlying very stiff cohesive deposits to approximately 18.5m. A 3.5m rock socket was then specified in the very weak highly weathered Mudstone bedrock. 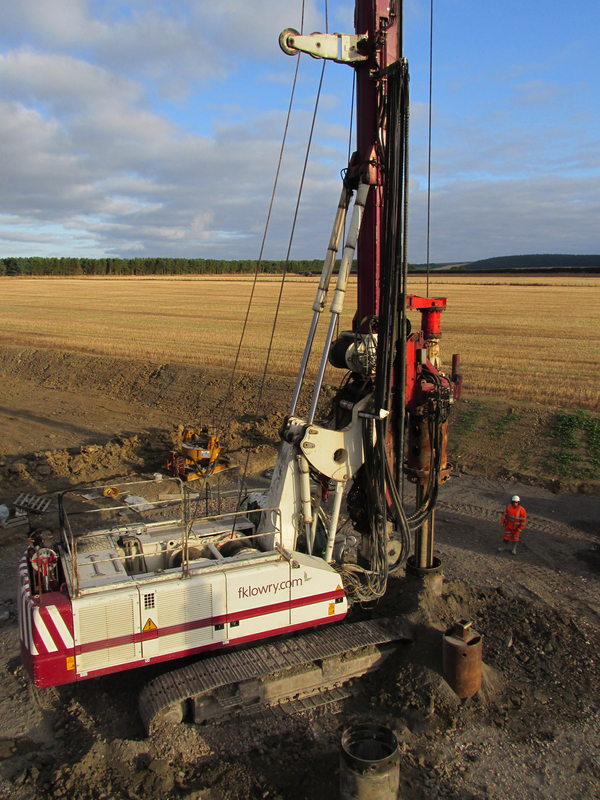 In recent years, FK Lowry Piling have successfully installed a range of piling techniques for Wind Turbine Bases across the UK and ROI.